The majority of factories in the UK are constructed based around a steel-framed design, from simple industrial sheds, to more delux or complex industrial plant and offices. Strictly this is known as portal frame structure as it means all the supporting structures for the steel building are taken up by the frame and around the edge of the building, maximising the interior space and the square footage available for use, whatever the factory will be used for. The metal-frame design also gives great flexibility for where doors can be positioned, allowing for access for loading or unloading, ease of material handling and space for larger machinery or for the connection to other industrial plant. Modern steel is coated at the factory giving a long-term weather-resistant finish in multiple colours reducing building maintenance costs and retaining professional looks long into the building's life. It is also common for older factories to be reclad with steel panels to improve both looks and reduce building maintenance. Steel framed buildings also don't have to be clad with steel panels, though obviously this is the cheapest solution. The frame can be fitted with glass, or in-filled with natural materials like brick or wood. In fact the flexibility of steel as the supporting structure, means that prestige factories and office space with canopy designs and complex structures can be designed and built. 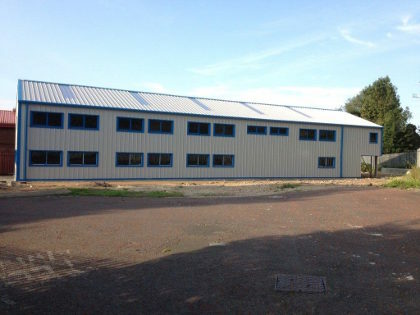 If you're looking for a new building for your business, or simple refurbishment or extension of an existing factory, steel or metal framed buildings are flexible, low cost and fast to implement. Factory use of steel building can very greatly. Simple production lines can be carried out within a simple 'shed-like' structure. More complex factories with plant and equipment require more sophisticated designs dependant on the location. The great benefit is flexibilty combined with cost efficiency. The great benefit of steel buildings for industrial use is the availability of internal space. All of the interior space is available which allows for high ceilings for tall machinery, big floor space for production lines and good light and access. Steel buildings for factory use can be some of the most sophisticated uses of a steel buildings. Technically most factories are mixed use buildings combining work areas and production, storage and office and administration areas which means designs have to accommodate this broad set of uses.